I am a project archivist at Columbia University’s Rare Book and Manuscript Library currently processing the Edwin H. Armstrong Papers. Previously I processed the Julius C. C. Edelstein Papers and David N. Dinkins Papers. I look forward to using this blog to share my processing experiences with archivists, library students, and anyone who may be interested in our work and the papers of Edwin H. Armstrong. Here are two more candidates for your “informative links”, on the Armstrong Blog. If you have travelled much around the city , or over the GWB, you have seen it. About seven miles North of the GWB, on the Jersey side. The best biography of Armstrong is Lawrence Lessing’s, “Man of High Fidelity, Edwin Howard Armstrong” Now a rare book at $75 to $140, there seems to have been an unauthorized reprint as a paperback. However it is now a FREE PDF file at http://www.archive.org . Enter the title at the top search box. I would have liked to see a multi-volume book, but this is the best we have. Hope these are of interest. Thank you for bringing the links to my attention. I have added both to the “Informative Links” on the right. Lessing’s biography of Armstrong is wonderful, I have read it now more than once! The NYTimes article quotes you as saying, ““When I was growing up I heard about Edison and Marconi, and I never heard of him,” said Ms. Comins, 37. “And now I wonder why.” I had a similar realization when I was in college, but concerning Tesla, and why Marconi was always given credit when the US Supreme Court decided that Tesla was the inventor of radio. MARCONI WIRELESS T. CO. OF AMERICA v. U.S., 320 U.S. 1 (1943). I am glad you are working on making his contemporary (and pallbearer) Mr. Armstrong better known. Thank you. Read the NY Times story about the archive work in progress. Thank you for that and also for this blog. I have two paperback copies of the Lawrence Lessing bio “Man of High Fidelity: Edwin Howard Armstrong” in very good condition with no broken spine and some age yellowing. I would be glad to contribute to the archive if you would like to have them. 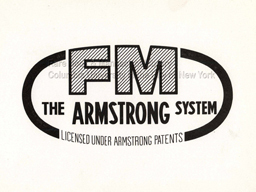 I’m writing a feature article about the Armstrong archive for the upcoming issue of the Columbia Electrical Engineering department’s newsletter. I’d love to interview you about the work you’ve been doing on the archive. Can you tell me the best way to get in touch? I was hoping that some of the material would be accessible on the web. It must be possible to get legal requirements worked out. It would help preserve the material if people didn’t have to go get the physical box and extract the original papers and photographs, just to look at them. It would also allow interested people who might not choose to come to Columbia to at least see whatever is posted to the web. What an amazing resource. Armstrong is one of my personal heroes. His relative obscurity is so inexplicable given the magnitude of his accomplishments. That Tesla has received much overdue recognition is great, but Armstrong will always remain a greater figure personally and a far more tragic loss. Given the epic nature of Armstrong’s inventions and his struggles, it has amazed me Hollywood has ignored his story yet found a way to create a film about the inventor of the variable-speed windshield wiper and his fight for credit and royalties from the automakers. (“Flash of Genius” http://www.imdb.com/title/tt1054588/) How absurdly low stakes compared to regeneration, FM and the fight against RCA. I personally want to just express gratitude for the dept and Ms. Comins for going to the effort to bring more attention to this giant. I’m writing in the hopes that I could ask a question related to these archives directly. If so please email me, if not thank you so much all the same.